Sometime between May and July 2006, 26 pots from the Cedar Grove site were stolen from the Arkansas Archeological Survey’s collections at the Southern Arkansas University Research Station. The Survey is working with SAU police and the FBI in attempt to recover the vessels. The Arkansas Archeological Survey has issued a press release along with a complete list and pictures of the stolen ceramics. Click here for a one year later update on the missing vessels. This program is currently under review by the Arkansas Archeological Survey and the Arkansas Archeological Society. More details will be provided as they are available. 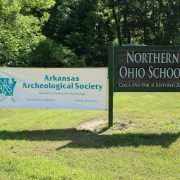 Established in 1972 by the Arkansas Archeological Society and the Arkansas Archeological Survey, the Certification Program provides a means of obtaining formal extended training in various aspects of archeology outside of an academic degree program. The program also provides recognition to those concerned and knowledgeable lay archeologists who perform a real service in helping to preserve the past for the future. You must be a member of the Arkansas Archeological Society. Society members may register in the Certification Program at any time. Each Field Training Program offers a combination of fieldwork and seminars on various subjects related to the Certification Program. There may be times during the year when Survey Archeologists request help on excavations or in the lab. The experience and time spent on these projects and at the Training Program is recorded in the individual’s Log Book and can be counted toward a particular certificate. Participants must attend the annual Summer Training Program in order to complete the program. The Log Book contains the requirements for each step of advancement toward a certificate. Survey Archeologists teach and review the participant’s work. Demonstrated skill is necessary to achieve any certificate. Log Books are submitted to the Certification Coordinator when the participant feels he or she has completed the requirements of a category. The Certification Coordinator reviews the Log Book to insure that requirements have been met. Certificates are announced and awarded at the Society Annual Meeting each fall. All records of the Certification Program, including copies of Log Books, reports, and evaluations are maintained by the Arkansas Archeological Survey. The Basic or first level is divided into three categories: Provisional Site Surveyor, Provisional Crew Member, and Provisional Lab Technician. Each category requires one seminar and some hands-on requirements. The individual learns basic techniques and is closely supervised. All three categories should be completed before moving to the next level of training. The second level is also divided into three categories: Certified Site Surveyor, Certified Crew Member, and Certified Lab Technician. This level provides considerably more training in fieldwork or labwork and requires several topical seminars. By the time these certificates are awarded, the individual works under loose guidance and can supervise other workers. The third level is a single category of Certified Archeological Technician. This is awarded when all six previous categories have been completed, and this award constitutes graduation from the program. The Field Archeologist certificate is awarded to participants wishing to make further contributions by carrying out an independent research project and having an article or larger manuscript published. These projects are designed in consultation with Survey Archeologists. To give you an example of what is involved in getting certified, here is a list of what it takes to become a Provisional Crew Member in the Survey /Society Certification Program. 1. Attendance and satisfactory completion of Basic Excavation Techniques seminar. 2. Minimum of 40 hours excavation under supervision. 3. Demonstrated ability to record all excavation data. 4. Experience excavating at least two different kinds of features or stratigraphic context. 5. Knowledge of how to lay out a simple grid on a site. There are over 100 Society members who are active in the Certification Program. Participants work at their own speed to complete milestone certificate levels. Experienced members also assist Survey Archeologists in many ways, including teaching newcomers during the Field Training Program. The Certification Program has proven over the years to be an excellent avenue for learning about archeology within a goal-oriented, structured environment. For a list of Society members who have earned their certifications, click here.